Yui-Juku (由比宿) is 16th post station of Tokaido. 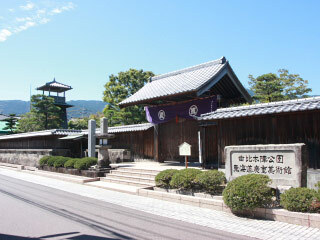 Yui-juku remains many traditional buildings and view of old Tokaido. Yui Shosetsu, the famous rebel during Edo period, was born here. His house is still remains. Satta Pass is located at the end of this post town, and has a great view of Mt. Fuji. There is parking and restroom at Honjin Park. Yui-juku is the 16th post station located just south of Mt. Fuji. It was used to be very small post town. It has many traditional houses still remains in this post town. It is the ruins of Honjin that was the hotel for Daimyo during the parade. THere is gate and keeps are restored. There are museum of Utagawa Hiroshige. It is a 400 years old coloring store. The famous rebel during Edo period, Yui Shosetsu was born in this place. This building was constructed in 180 years ago. It was constructed in Meiji period. It is craft museum that displays local treasure of the post town. It is registered as the national cultural asset. It is located Mano-juku. Fujiya was one of tea house for resting place. Satta Pass is located between Yui-juku and Okitsu-juku. It has one of the best view of Mt. Fuji. The famous Ukiyoe Artist, Utagawa Hiroshige made Ukiyoe of Yui with this view.